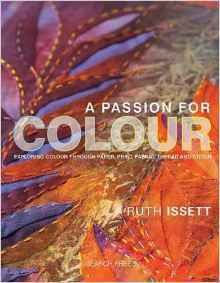 Ruth Issett is passionate about colour, and in this exciting and vibrant book she explores the use of colour through her own work as a textile artist, designer and embroiderer. The clear and informative text coupled with numerous examples of Ruth's work make this not only a comprehensive guide for artists, designers and students with an interest in the use of colour in textile work, but also a beautiful 'must-have' book for anyone who simply loves colour. Throughout the book the reader is encouraged to experiment with and, above all, enjoy colour and the challenges it offers. It begins with detailed coverage of the range of colouring media and surfaces available to the contemporary textile artist and how these can be used with print and stitch. There follows an inspirational journey through all aspects of colour, including colour mixing; adding tiny touches of colour; achieving intensity, vibrancy and depth; working with opacity, transparency and translucency; colour selection and combination; and working with a limited palette.